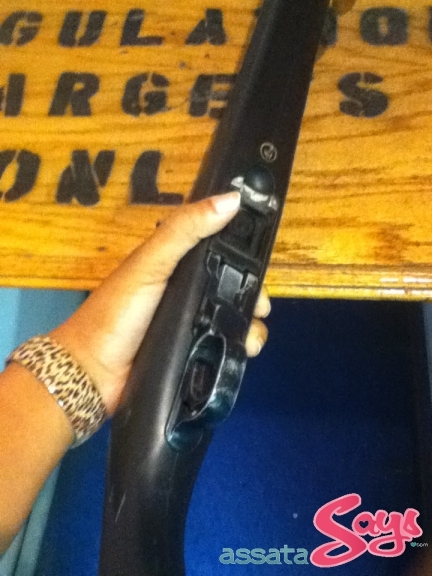 Yesterday, my mom and I finally redeemed our KGB Deal for a trip to Westside Pistol Range. The closest I’d come to shooting a real gun before my trip to WPR was shooting targets for a crappy stuffed animal at Six Flags. 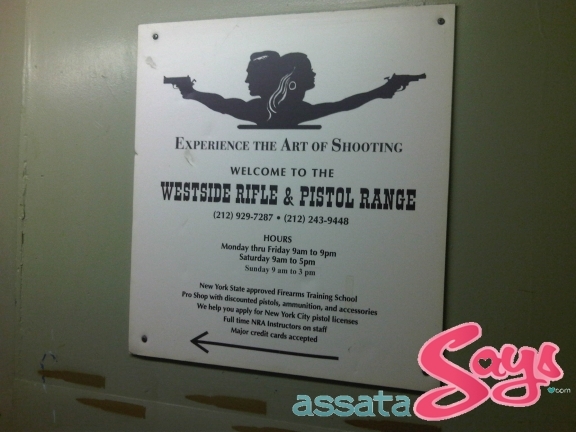 The Westside Pistol Range is the last indoor gun range in Manhattan. It’s normally $65 for a non-members first trip to the WPR but through KGB, my mom and I got to go for $32.50 a piece. 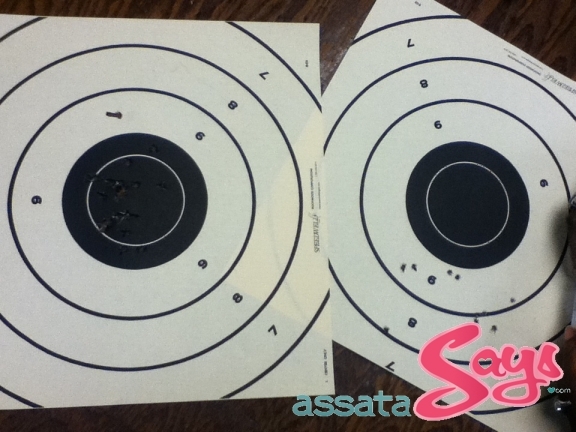 We sat through a 30-minute instructional class on safety and basics on operating a Ruger 10/22 semi-automatic rifle. That was my first sheet. 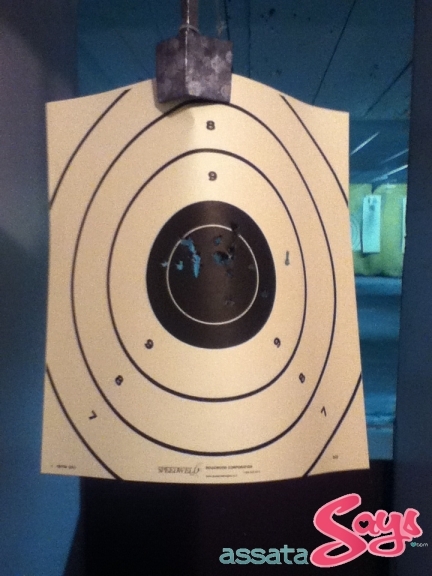 I have no idea how many feet the target sheet was away from me but I did okay. The goal was not only to hit the black target in the center of the sheet but to make a big hole with all of the bullets which means that you hit at the same point all 25 times. One of my bullets were bad but 23 hit inside the target, one hit outside. That’s a photo of my sheet (on the left) and my moms’ (on the right). She didn’t do much better the second time either but she wouldn’t let me photograph it (probably because it was so bad). Ha! After shooting 24 of my 25 bullets from the 5 magazines, I reloaded and went back at it again. I had my instructor record me the second time around. Pretty good for an amateur, right? I can’t wait to go back. For more info on the Westside Pistol Range, click here. 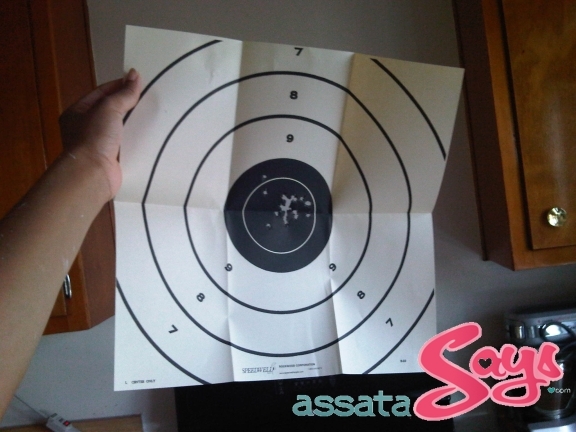 This entry was posted on Saturday, September 3rd, 2011 at 10:39 pm	and is filed under ASSATA. You can follow any responses to this entry through the RSS 2.0 feed. Both comments and pings are currently closed.